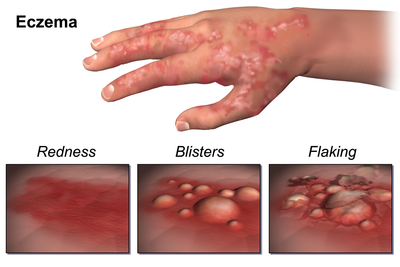 Three of the most common symptoms of Eczema. Atopic dermatitis on the arm crease. This type of eczema is a condition of damaged skin due to the use of some sort of chemical or liquid. There are two different categories of Contact Dermatitis: irritant and allergic. Irritant damage can be caused by simple things like hand washing or contact with some sort of chemical. Allergic damage can be cause by different types of skin makeup or by different types of plants like poison ivy. There are some steroid medications that can be used to help manage this type of eczema, but the most basic help is simple moisturizers. A change of soap and wearing of gloves are smart actions to help this condition and many other medical conditions. Dyshidrosis dermatitis on the sole of foot. Nummular Dermatitis on calf and knee. This skin condition is most commonly known to form in coin-shaped sores. They may be wet, oozing, dry, itchy. The most common location of this eczema are legs, backs of the hands, forearms, lower back, hips, feet. The cause of this eczema is unknown, but exposure to chemicals, metals, and insect bites are suspect for their appearance. Steroids and antibiotics are available to help manage symptoms, along with simply soaking the skin in lukewarm water and avoiding irritation of rubbing fabrics or other harsh materials. 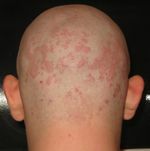 Seborrhoeic dermatitis on the head and scalp. Seborrheic Dermatitis is the scientific name for dandruff. This condition can affect the scalp (common in infants), eyebrows, side of know, behind ear, groin, chest, etc. More extreme cases of dandruff can include redness of skin, itching or burning, swollen or crusty skin. This condition can be a result of hormonal changes or illness, yeast infections, irritating chemicals or washes, or the over growth of yeast in a particular area. Medications and lotions are common managers of this eczema. An extreme example of Stasis dermatitis. This skin condition occurs when the veins of someone's legs do not properly transport blood to the heart. Results of this can be darkening of skin in spots. More serve conditions of this can be different types of extreme scarring. There are some creams to improve this condition, along with elevation and soaking of the skin. However some cases may require medications. This is an educational video all about the symptoms, management, details, ect. of Eczema. ↑ Understanding Eczema Neosporin. Web. Accessed: October 22, 2016. Unknown Author. ↑ Eczema National Association. Web. Accessed: October 22, 2016. Unknown Author. ↑ 4.0 4.1 4.2 4.3 4.4 4.5 4.6 Types of Eczema Web MD. Web. Accessed: October 22, 2016. Unknown Author. ↑ Mayo Clinic Staff Print Dyshidrosis Mayo Clinic. Web. Accessed: October 22, 2016. This page was last modified on 23 November 2016, at 16:21.